As Pet Professionals, we are always going to be looking for new customers in our business. It’s one of things that as a Business Owner we need to be constantly plugging away at. When you think of how to get new customers you might be worried that it’s not your area of expertise or you don’t have time. 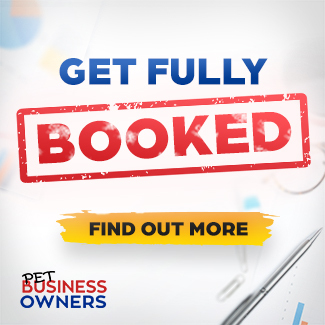 There are however lots more ways than you probably think to get more customers and a lot of them really don’t involve a lot of selling – more showing and telling! Do not underestimate the power of a social media following when it comes to getting more customers. People look for social proof that you are a legitimate company and having an active, current and updated Facebook Page shows them you mean business. Just the other day a customer commented that they chose our business because we have such a large Social Media following. It’s easier to sell to people who already know you and that goes the same for someone who has been referred to you. People trust their friend’s recommendations and so if they say you are great with Fido then you are going to get that business. Make it easy for people to refer you – create a form they can submit or an email they can forward on to people that might be interested in your services. I know that networking scares some people, but chatting to other people on social media that are in your field can build great relationships. If you are a bit shy, then why not reach out via email and ask them a few questions about their business. People love to tell you about their business and they will be proud to share their interview on social media with their followers. Facebook ads are a great way to drive targeted traffic to your website. Make sure you target your ideal customer and make it easier for them to understand what you do and how to contact you once they click on your ad. Start with a small budget and test it. Also, be aware of the difference between likes and shares versus new business. 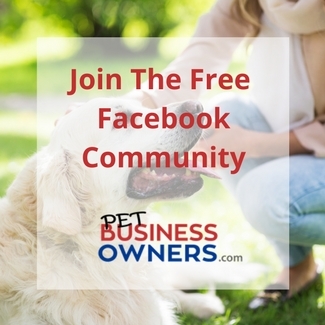 Starting a Facebook Group isn’t a quick fix to get new customers, but it does raise your profile in the community and you get to hear more about what pet lovers in your area are interested in. Listen to what questions they have in the group, what information they are looking for and what interests them and you have an endless supply of blog posts! I don’t recommend that you join these groups to promote your business and spam the groups. However, if someone has a pet related questions and you have some advice or an opinion then you can share it in the group. Start getting to know people and they will take an interest in what you do. Become seen as an expert. Attending events can be great exposure for your business. Some of our most successful events have been non-pet related. For example, Wedding Shows, Travel Fairs etc. And, don’t think you need to rent a stand at them to be able to get new business from them. Go along to events and just talk to people, network, make connections. A Pet Competition can be an excellent way of creating more awareness for your brand and having some fun at the same time. My key tips would be plan it, have a good structure, a clever name and a reason to do it. I am not talking about blasting people with spammy emails, but instead sending them useful information that they will love to share. A weekly email with your latest blog posts and news is perfect. Keep it short and sweet, but packed with useful info so people know what you do and how to contact you when they need pet care. Note – you can do a newsletter in 15 minutes quite easily. Make it a to do task each week. By consistently blogging you are driving more traffic to your website and reaching more pet lovers in your area. Educate potential customers on what you do and how you do it. Answer the questions that others won’t answer and be transparent and trustworthy. When you take care of people’s pets it is important that they trust you. Being the go to resource for anything pet related in your area will make you the number one choice for pet care. People are in a hurry and don’t want to spend ages looking for your contact form or phone number. Make everything super simple for people. Make sure you are telling people that come to your site what to do next. Is that to call you, fill out a contact form, register with you. If you don’t tell people what to do, they won’t do anything! And to get more customers you need to tell them how to become a customer! There are still a lot of people that don’t have a mobile friendly website. Which means you are being penalized by Google and making it hard for your website visitors to read your content. 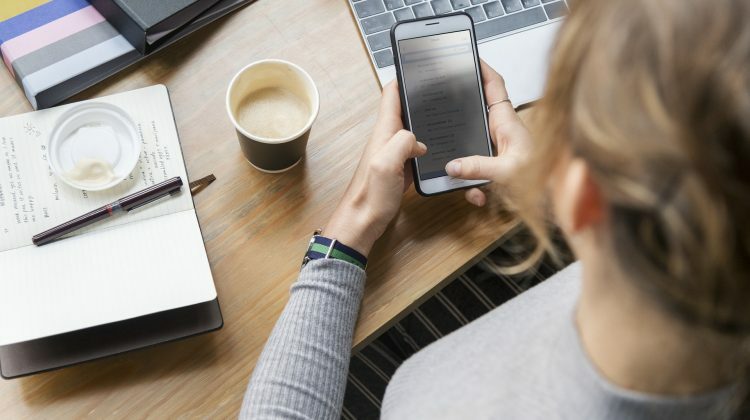 Ideally you should have a mobile responsive website, but if not then install a mobile plugin and make sure you are making things easy for your potential customers. We recently franchised our business and as new franchisees are coming on board they are all getting their vehicles sign written. This is like a moving ad for our business and has created a lot of business for them in their areas. Make sure it’s clean, simple and fits your brand. Also, get your phone number on there so people can contact you. It’s ok if they need to leave a message you can always call them back. Just make sure your voicemail tells them you will return their call in X number of hours. You could almost be guilty of thinking that the business card is dead! But people still do ask for cards when you are talking to them. If you are having a conversation with someone in the grocery store in the dog food aisle about what type of dog they have, then you want to be able to leave them with your card. I know I would never remember the name of your business days later when I needed a dog walker – so make it easy for them. I know none of us like being on camera, but answering questions about your business is a great way to build trust in your community. Short videos (max 2 minutes) are great to share on Facebook and build your YouTube Channel. Put a face to the brand that people can trust. What’s great about Twitter is that it’s ok to just start a conversation with someone. In fact, that is what the platform is for. Search for people in your area talking about pets or pet related subjects and start up a conversation. LinkedIn has a great search feature where you can find pet owners and then connect with them. If you are sharing articles you have written about pets this will catch their attention. Not one of the most exciting platforms to use, but you will probably find professionals on there that need your services. Pet Lovers love to share pictures of their pets, so with a bit of searching for local hashtags you should be able to find lots of loving pet owners to connect with. Remember there is no need to sell – just get to know people and their pets. People will naturally found out what you do from your BIO and when they are ready will be in touch. People love visuals and visuals with cute pets even more. Get the conversation going by creating inspirational quotes, conversation starters and fun facts – all with amazing images. You will be surprised how people love to engage with these types of posts. Guest blogging on another website can be a great way to get in front of more pet lovers and build your credibility as a pet professional. Most of the time when you write something for another website they link back to your website. This is not only good for SEO but also drives more traffic back to your website. This isn’t an easy one to just jump right into, however if you are running a pet competition in your area then it is likely that you will get some Radio or TV coverage if you promote the competition correctly. The other way to get on the radio is pitch journo’s directly with news story ideas. Twitter is the best place to do this, but you need to be quick! The news moves very quickly. There is no need to sell to them, just talk to them about their pets, tell them about yours and then leave them with a card. Keep it casual and if they have questions then it’s always a great idea to direct them to resources on your website. A good website will do all the selling for you! Whenever you buy something you usually look on Google to see if there are any bad reviews. Reviewing pet related products is a great way to get found in Google Search. Don’t be afraid to contact brands and ask for samples to review. If you have a good social media following, blog and website they will jump at the chance to work with you. These people are dealing with pet owners who are travelling all the time. Why not see if you can come up with a referral plan with them so both of you can benefit. Make it easy for pet owners to book flights, hotels and pet services. Having your name as sponsor can give you great exposure, given the right event. Maybe you want to give a voucher for your services or a hamper to a raffle. Make sure that you know what the footfall to the event will be, what type of people are planned to attend and how the event will be marketed. While not everyone will claim the vouchers they win you want to make sure that if they do they are your target customer. There are a lot of animals going through rescues and by getting to know the organisers and helping, there is a chance that they might refer you to new pet owners. 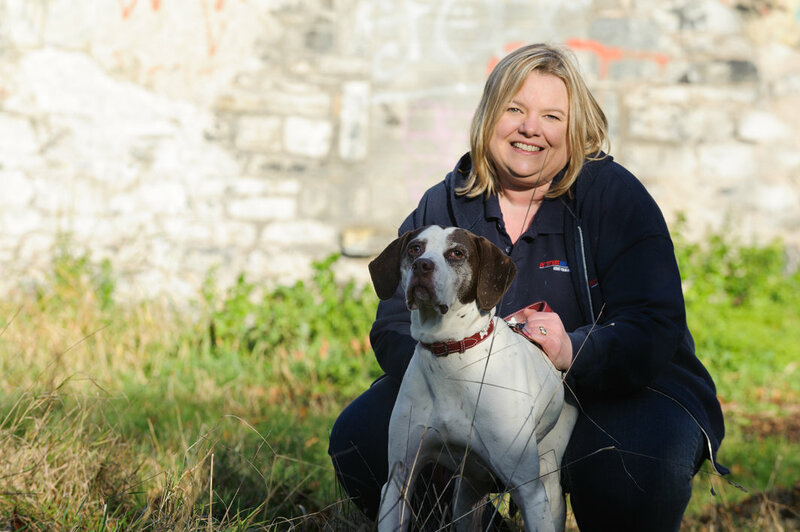 Maybe you can create an offer for people who rescue from them – an introductory discount for anyone taking a pet from them. Getting to know pet owners can help you target all your content to meet their needs. If your survey reveals that your potential customers biggest fear is trusting a pet sitter than you need to make more of an effort to address that issue on your website, in videos and on social media. 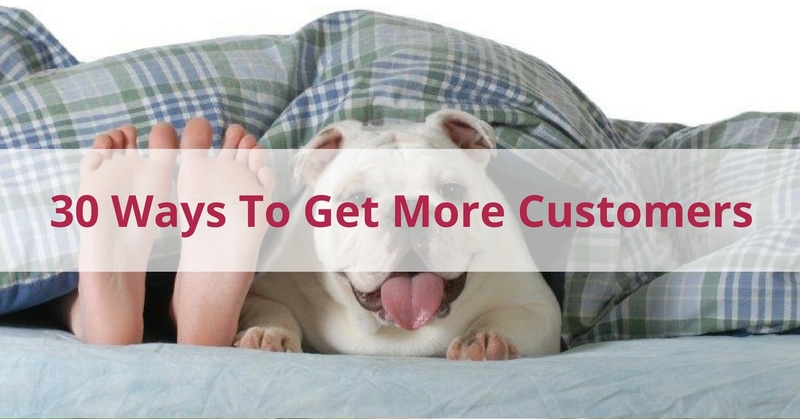 Find out what your ideal customers want and give more of that to them. If you write articles about current pet issues, problems, trends, stories etc. then it’s likely that at some stage people are going to share them for you. This could be existing customers, new fans, friends of followers. Newsjacking is a great way to stay relevant and benefit PR wise from trending topics. Can you team up with another business to create an event, run a competition, do a giveaway? Something that means you can both benefit from each other’s audience. Maybe you can run a referral programme together where you pass on referrals for each other. #30. 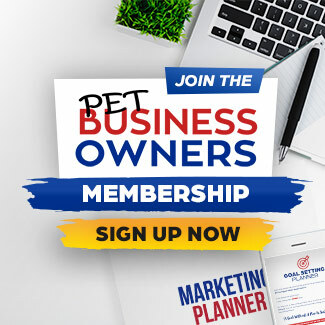 Be Useful to Your Audience and Become the Go to Person for Everything Pet Related in Your Area! This is probably the most important lesson you will learn in marketing your business. Stop selling and start helping people. People don’t want to be sold to – instead they want their problems solved. All of these ideas are things that you can implement straight away on your own. They are not complicated, just perhaps need a little bit of planning to get them right. If you want help then there are a couple of ways I can assist you.